Today's guest article is about creating domain names for specific landing pages on your websites or blogsites. A domain name is the address that's used to direct others to your author website, and it's usually preceded by www. For example, my main website and blog is at http://TheSavvyBookMarketer.com. One of the first decisions authors must make in setting up an author website or blog is what to call the site and what website domain name to use for marketing purposes. But it may be a good idea to purchase several domains and point them to your home page or to different areas of your website. Below are some examples of domains commonly used by authors. Choose a domain that matches your book title and point it to your book sales page. For example, SavvyBookMarketer.com points to the sales page for my Savvy Book Marketer Guides. If your book is not yet published, you may want to make sure the domain name (or an easy variation of it) is available before you decide on the final title. Depending on your business strategy, you may also want register a domain to match your publishing company name. For branding purposes, get a domain that matches your author name and point it to the "about" page or media page on your site. If you have written several books, you can use your author domain name for your main website. You may have to be creative to register your own name – try using a middle name or initials, adding another word such as “author,” or using an alternate extension such as .net instead of .com. If you have multiple websites, you can create a personal website using your author domain name and link from that site to your other sites. For example, DanaLynnSmith .com points to a website that contains links to all of my other sites. For search engine optimization, buy a topical, keyword-rich domain to point to your home page or book sales page. Look for domains that contain keywords people are most likely to search for when looking up information about your topic. For example, SellingtoLibraries.com points to my sales page for my book, The Savvy Book Marketer's Guide to Selling Your Book to Libraries. According to Search Engine News, a domain name that exactly matches the keywords entered into a search engine tends to give that domain an advantage in the search results. Having keywords in the domain name also increases the chance of the searcher clicking on your link when they see it on the results page. The Google Keyword Tool is a good place to research the best keywords. Some website hosting services will give you a free domain name, but it's best to purchase your own domain so that you have complete control over it, especially if you later change hosting services. I use Go Daddy for my domains because of the low price (about $12 a year) and free and easy domain forwarding service. One free email address is included with each domain and you get POP3 service to access your email through programs such as Outlook. The signup process can be a bit cumbersome, because they try to sell you other products during the process, but their domain management tools are easy to use. Want to learn more? Here’s a free tutorial (sorry, the link doesn't work) on how to buy and forward domain names to your website using GoDaddy. As a bonus, I'll show you a shortcut that makes the purchasing process much easier and show you exactly how to forward your domain to your author website. Dana Lynn Smith is a book marketing coach. 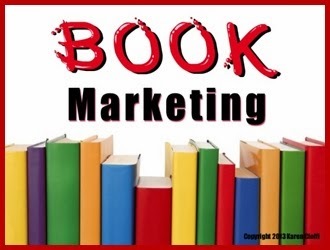 For more tips, follow @BookMarketer on Twitter, visit Dana's blog and get a copy of the Top Book Marketing Tips ebook when you sign up for her free newsletter at http://BookMarketingNewsletter.com. Wow Dana, great article, thanks Karen for guest posting her:) I'm not to this point yet since I only have a blog, but I am book marking this post for sure. Hi, Deana, I'm still working on this myself. So much to do, so little time. Great blog! Would you ever think of guest posting for me at laurabwriter.blogspot.com? You definitely have the stuff I'm trying to share. I'm following now! Hi, Laura, It's so nice to meet you and thank you!